From the Obama whispering in Hillary's ears is news?!? department... Higher Than Why wrote in to tell us about their weekly show @ Plush. They come on at 9pm and then you can stick around for Table Manners Crew. Higher Than Why's got your ear drums buzzin' with a full band, Zack (drums), Nate (bass), Jake (keys) and Justice on vocals. I'm really feelin' the song Appetite on they myspace page. Check it out. 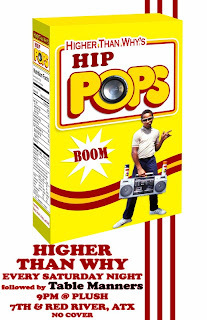 Higher Than Why formed in the Austin, Texas conscious underground hip hop scene circa 2004. HTW uses drums, keys, bass and quick witted, forward thinking lyrics by Justice on the mic. No guitars. Their sound is booming, eerie, jammy and spacey all while backed by percussively metered wordsmithing, presenting thoughtful insight on a compelling sound scape.